While the weather outside is frightful, there’s a party inside, how delightful! 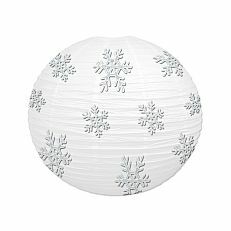 PartyCheap has an extensive selection of winter and snow decorations, let's be even more creative with DIY’s and turn your house into a winter wonderland! PartyCheap's Jumbo Paper Lantern is a blank canvas that can take on your most creative ideas. Let each member of the family be creative by giving everyone a lantern for their own design. When everyone finishes painting or otherwise decorating, hold a family vote to see who had the best design and the winner can get a little prize! Hang each lantern in the house to show off everyone's artistic abilities! Not only will this be a fun Christmas decoration, but the memories of painting them together will last a lifetime. Create an entire winter scene indoors by using our Snowscape Backdrop and Winter Sky Backdrop. Hang these two backdrops on your wall and let your families creative juices run. Grab some paint, markers, crayons, glitter - whatever you can find - and let each member of the family draw part of the scene. Each person can contribute a favorite holiday item, from snowmen to Santa to evergreen trees. It’s going to take some work, but the end result will surely be worth it. Need more ideas? Add some Elves. Maybe mistletoe? Regardless of what ends up being created, it will be a fun time! 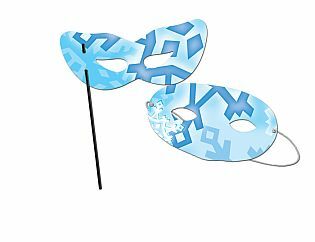 Sure, the Snowflakes Luncheon Plates might be best used for holding food, but it could also be a good base for a mask! Add feathers or sparkly garland to make your design come to life. You can even paint the backside of the plate to make your own holiday design and a reversible mask. Don’t forget to cut out some holes for your eyes! When your holiday mask is finished, glue a Popsicle stick to the bottom to use as a handle to hold your mask on your face all evening! You can also tape a rubber band to the backside and then you can use the rubber band as a strap. Want some more creative winter decorating ideas? Click here to see 18 really neat do-it-yourself home winter decorations! This link provides creative, yet simple decorations that anyone can make! Not only will these be creative items you can display around the house, but making them will be extremely rewarding! The holiday season one is one of giving, so give yourself the opportunity to create an innovative, do-it-yourself winter decoration! While it’s important to have some of the traditional winter decorations, go ahead and step out of the box! Create some decorations that are unique to your home and will leave your guests speechless. PartyCheap has products that that can be decorated, even more than the design that comes on it! Click the green “Shop Now” button below to see our extensive list of winter decorations. Head over to our Pinterest page for more ideas! What are you waiting for? Turn your house into a winter wonderland!